« End of Summer Specials on Brazilian Jiu-Jitsu and Muay Thai only $55! 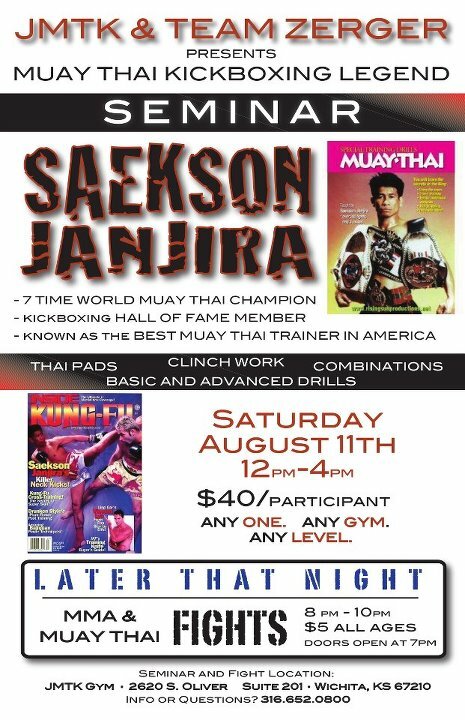 Come check out an amazing seminar with several time world Muay Thai champion Saekson Janjira. Saekson has trained several UFC fighters and Muay Thai champions. Only $40 and open to anyone from any gym at any skill level. And later that night Friday Night Fights ICT is returning for a special Saturday night edition! Come out for an amazing night of excitement! Aug 11th noon for the seminar and then fight at 8pm. See you at JMTK!